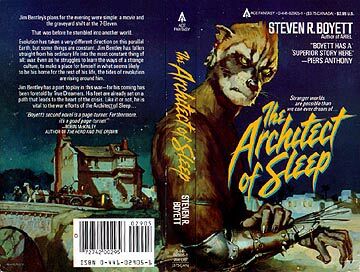 Boyett, Steven R. The Architect of Sleep . Ace 1986. What if: Intelligent life evolved from raccoons rather than primates. Summary: A human spelunker exits a Florida cave to find himself on an Earth populated by oversized raccoons. There he is drawn into a fight for control of a kingdom where Georgia should be. Comments: The book ends mid-story, but due to disagreement between Boyett and his publisher, an expected sequel entitled The Geography of Dreams was never published.